This is Delilah , just one of our beautiful Miniature Australian Shepherds. 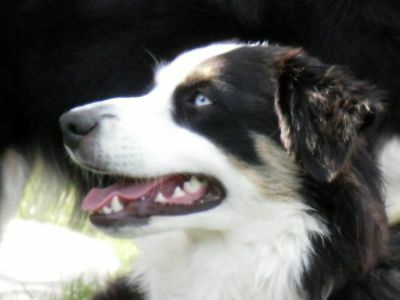 She is black tri with two crystal blue eyes. We search for a long time before finally finding her and we are so happy to have her as part of family. Hi Karla, we remember Delilah as a puppy. Beautiful. We got our Rio from you 9 years ago. Am not able to find your web site. Today Rio our fur baby and best friend went to heaven, We think the hardest part of losing Rio isn’t having to say goodbye... it’s the way our entire world will change without him and the emptiness that’s left in our hearts when he let go. Rest in peace our sweet Rio! Thank you for the 9 wonderful years you gave us, which was everything that you had to give. We will miss you and we will see you again in heaven.